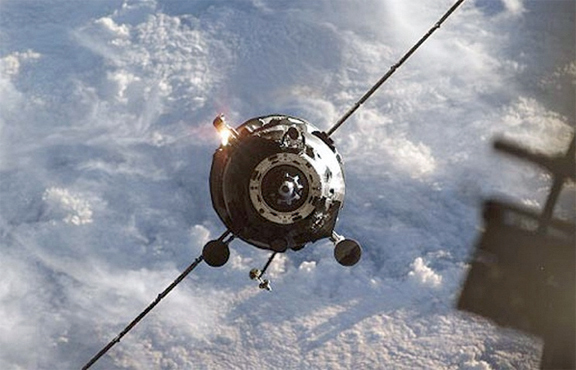 [SatNews] Russia’s Progress M-27M spacecraft lost the near-Earth orbit and burned in the dense atmosphere above the Pacific Ocean at 05:04 a.m. Moscow Time [02:04 UTC] on Friday, May 8th, Russian Federal Space Agency Roscosmos told TASS. "The spacecraft entered dense atmosphere at the 160th coil above the central part of the Pacific," a Roscosmos spokesman said. He said the results of investigation into the causes of the accident that occurred when the Progress was being orbited will be submitted not later than May 13, when a relevant state commission completes its work. The Progress M-27M cargo spacecraft was launched on April 28 from the Baikonur space center Russia leases from Kazakhstan on a Soyuz carrier rocket. The rocket took the spacecraft to a higher orbit than required to dock with the International Space Station (ISS). After a few unsuccessful attempts to get control of the spacecraft, experts gave up the idea. The Progress was taking food, oxygen and other cargo to the ISS crew. A rocket and space industry source earlier Friday told TASS that Roscosmos plans to adjust the program of flights to the International Space Station due to the recent accident involving the Progress M-27M spacecraft. "It is suggested that the return from orbit of the expedition which is currently there be postponed from May 14 to June, then, in late June—early July, a Progress cargo spacecraft be blasted off to the ISS, and then, in the last ten days of July, a manned Soyuz launch be made," the source said. He said the proposal was forwarded by a Roscosmos working group and has not been approved yet. However, the source said, in connection with the fact that according to preliminary conclusions of the state commission, the Progress accident was caused by an emergency situation at the third stage of the Soyuz-2.1a carrier rocket, more time will be needed to check already manufactured rockets.